I had been vaguely aware that Ahmed Abdul-Malik, Thelonious Monk’s onetime bassist, had made strides in mixing “world music” with jazz back in the ’60s, but never investigated the specifics. Coming across his 1965 album Spellbound in a store one day, I decided to give it a try. Turns out it’s the wrong place to start, but it got me on the right path eventually. Spellbound‘s attempt at world jazz, though, is heavy on the jazz. It’s primarily an evening-bop album, well executed straightahead stuff. Oud player Hamza Aldeen appears on only two of the LP’s four original tracks (a bonus track on the CD is an oud-less blues), and his lone solo, on “Song for Delilah,” is treated like an externality — the lone oud with very light bass and a whispered hi-hat beat. Turns out, Spellbound was Abdul-Malik’s final album as a leader. His previous albums were more involved efforts at introducing the oud and Middle Eastern musical styles to a jazz audience. Jazz Sahara, from 1958, is the one that’s called out by Jazz Times in this 2012 article. This is a full-out Middle Eastern band complete with Abdul-Malik on oud; Jack Ghanaim on the kanun (qanun), a jangly stringed instrument; and Mike Hamway on the goblet drum (darabeka) — plus saxophone solos by Johnny Griffin. Track times are around 10 minutes each, providing plenty of space for a chantlike groove to simmer. Quotes aside, Griffin’s solos work well, but I get more out of Lee Morgan’s trumpet solos on East Meets West, Abdul-Malik’s 1960 date. Morgan seems more willing to let the surrounding single-chord rhythm steep and flow around him. The carefully emerging trumpet solo on “El-Lail (The Night)” is particularly delicious. Maybe Spellbound represented further compromise. 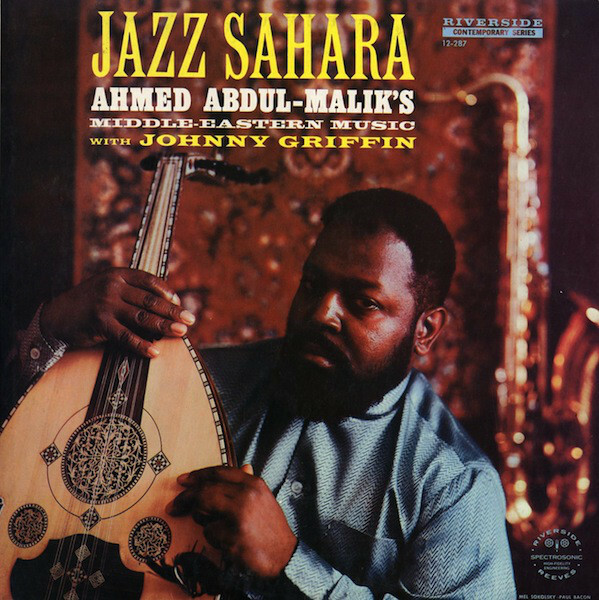 Then again, Abdul-Malik never stopped playing normal jazz; you could also view the album — two of its tracks, anyway — as a true melding of the oud into a full-on jazz setting, rather than a more comfortable environment. 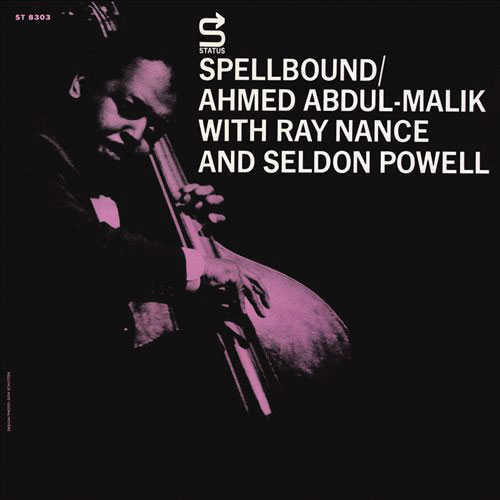 Spellbound is a more-than-competent album, with some eye-opening violin solos by Ray Nance (better known as a cornetist for Duke Ellington), but I’ll stick to the more world-music sounds of Abdul-Malik’s earlier albums. Moe Staiano’s brainy punk band Surplus 1980 has been playing gigs again. I finally caught up with one — at the Starry Plough on Saturday night. The band’s music, documented on the album Relapse in Response and the EP Arterial Ends Here, works from often stomping rhythms, sometimes with tricks like the occasional odd time signature. Math rock and jazz aren’t far removed from Surplus 1980’s explosive punk. In the studio, Moe can bring in guest musicians to flesh out the jazzy ideas, but there’s no substitute for seeing the band live and getting caught up in those infectious rhythms. Mark Pino plays drums for the band, and Staiano occasionally joins him on a second drumkit. I’d forgotten what a pleasure it is to watch Staiano on the drum kit, bashing away in a state of manic control. 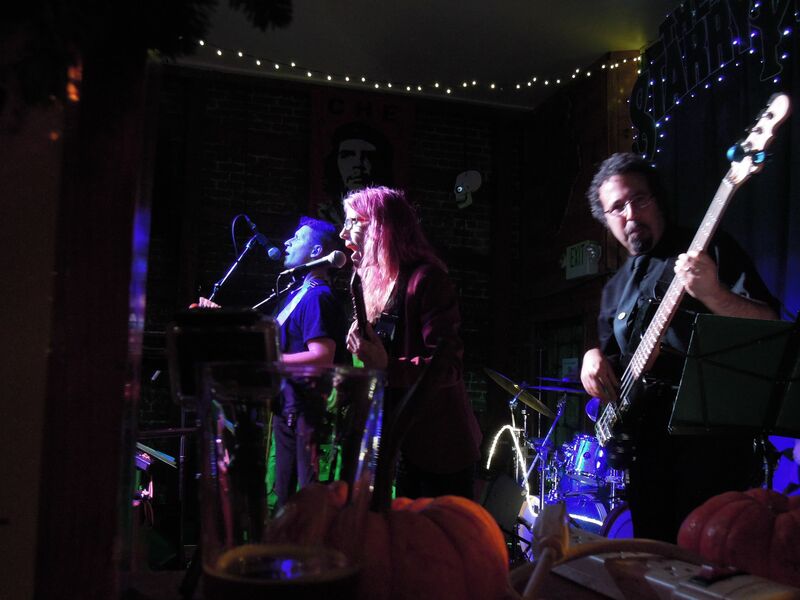 A couple of songs on Saturday night had the two of them bashing away at unison phrases while the two guitars provided chunky riffs as well as bouts of electric noodling and triggered keyboard sounds. This was bassist Steve Lew’s last gig with the band. On a sadder note, the whole night was overshadowed by the tragic warehouse fire in Fruitvale, news of which had spread earlier in the day; Surplus 1980 gave their proceeds to the victims and passed out a donation jar as well. I regret that I missed the previous set, of John Shiurba’s Vegan Butcher. It’s guitar-based slowcore, and I like what I’d heard of it on Bandcamp. Hopefully there’ll be more chances to see both of these bands in the coming year. It looks like prog band Reconnaissance Fly picked up a few new fans Wednesday night. The audience was sparse, sure. It was a Wednesday night and the Octopus Literary Salon in Oakland doesn’t look like it has room for much of a crowd anyway. But the people there were open to the music and happy about what they heard. A couple of conversations about the Canterbury sound formed after the show. I’ve seen Reconnaissance Fly a few times now, so while the music was good, the novelty for me was in seeing the Octopus for the first time. It’s a cozy and modern bookstore and cafe with several shelves of tantalizing books and a menu with microbrews and panini sandwiches. It seems like a great place to just hang out, which is exactly what was happening — the audience seemed to be folks from the neighborhood who just happened to be out, checking out what the Octopus had to offer. I like that. The band’s set included most of the new Off By One EP and three new songs by vocalist and flutist Polly Moller. (Most of the EP’s songs were written by bassist Tim Walters.) Given the nature of the venue — small, relaxed, surrounded by books — they did lean more toward their Canterbury side. Lots of relaxed melodies and odd time signatures. That doesn’t mean they didn’t rock a little. From the drumkit, Larry the O again pumped a lot of energy into the music. Hopefully some of those new fans (including one who was aware of prog history and early Genesis) really will take time to check out more of the band’s music. And hopefully I’ll take more opportunities to visit the Octopus. Not sure I’m cut out for the literary events that make up the bulk of their live entertainment, but it looks like they book a pretty healthy music calendar. We visited the Monterey Aquarium last weekend, and it wasn’t until we were nearly in Monterey that I remembered one reason why I love that drive so much. It isn’t the thick tourist traffic or the trucks on two-lane roads. It’s the chance to tune in KPIG. We’re an anachronism – a throwback to the days when real DJs picked out the music, and listeners expected something more from a radio station than just a couple of hundred songs repeated over and over, with some “big voice” guy yelling about how great it all is. I’ve noted before that I’ve backed away from the classic rock of my younger days. KPIG is different. The programming has roots music as a base — country-rock and bluegrass, you might say — but with liberal doses of blues, funk, jam bands, and lots of obscurities or corner-case artists that you wouldn’t find on mainstream radio of any stripe. And when an overly familiar tune shows up, it’s the exception, not the rule. Check out a playlist and see what you think. KPIG is a rare gem. Even college radio is losing this spirit, this willingness to challenge the listener and serve as a gateway for musical discoveries. KPIG charges a nominal amount to listen online — $5 per month or $50 per year — and it’s so worth it, just to know that radio like this can still survive in this cold cruel world. As for the drive to Monterey, I caught wind of two songs that have become new favorites of the moment — John Fullbright’s “All the Time in the World” and Abigail Washburn’s “Chains.” Neither one is brand new, sure. But KPIG was there to tell me about them. This week, Myra Melford has been performing at the Village Vanguard in New York, showing off her four-year-old working quintet, Snowy Egret. It’s her first stint at the Vanguard as a bandleader — a nice milestone in a career that’s already varied and accomplished. And it’s a nice follow-up to her recent residency at The Stone, which yielded a series of videos and a free digital EP. The band is a nice choice for the Vanguard, too. Snowy Egret, the band’s self-titled debut album, is a good showcase for the snappy creative jazz that Melford has been perfecting since her piano-trio days in Chicago. The compositions are engaging and thought-provoking as always, and the instrumentation makes for some intriguing sounds. The writing seems tailor-made for the clipped syllables of the trumpet, executed by Ron Miles. Liberty Ellman‘s guitar adds a liquidy quality; on “Ching Ching/For Love of Fruit,” it mixes with Melford’s harmonium (an accordion-like instrument that once caught her eye in India) for a folksy sound that’s hard to identify at first. Tyshawn Sorey‘s drumming, varying from subtle shading to vicious attack, is stellar as always. He has a way of saying a lot with even the lightest of touches. Here’s a good trio moment from “The Kitchen,” with Melford soloing, backed by robust acoustic bass guitar from longtime compatriot Stomu Takeishi. Like all great artists, Melford has a wide variety of influences and has taken her music in many directions. But I’ll always have a soft spot for her crisp, articulate “jazz” playing. Snowy Egret has that in spades. Snowy Egret, the band, will be at the Village Vanguard through March 6, and will also tour in Europe starting in late October.